Kits in the pictured color sets are available beginning April 6 at Little Skein in the Big Wool. Imagine yourself in a library, surrounded on all sides by tall bookcases. From the floor almost up to the ceiling, the shelves are crowded with rows of books: thick books next to thin books, bright new books next to faded old books, displaying spines of every color. Inside are stories of every kind, just waiting for you to discover them. Bibliophile is inspired by the juxtaposition of colors and textures seen in a shelf full of books, and the twists and turns taken by the stories inside them. 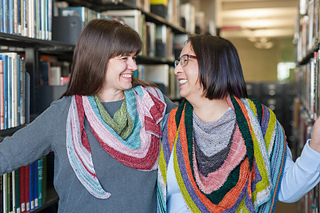 Each section of the shawl features a slightly different texture pattern and shaping, creating variations on a theme; your choice of colors will determine whether the overall effect is subdued or vibrant, quiet or bold. 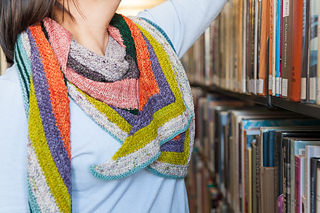 And when the knitting is finished, you can wrap yourself up in your love of books. Yarn requirements: Small size uses 5 coordinating mini-skeins of at least 25g each (~85 to 90 yards), for a total of 435 yards. Large size requires 10 coordinating mini-skeins for a total of approx. 870 yards. Finished size: The small is 62 inches across top edge (including angles and curves) and 18 inches at the deepest point. 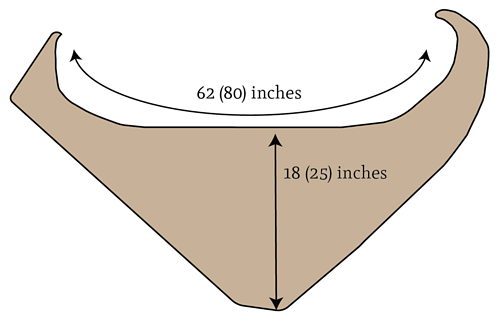 The large is 80 inches across the top and 25 inches deep.